Flabebe Red in game: 567 Who? Important notice! Pokemon Flabebe Red is a fictional character of humans. Flabébé (Japanese: ???? 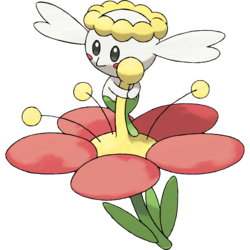 Flabebe) is a Fairy-type Pokémon introduced in Generation VI. 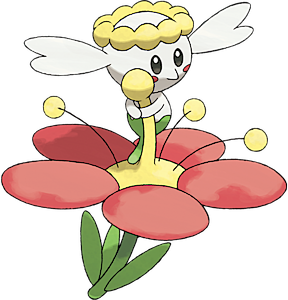 It evolves into Floette starting at level 19, which evolves into Florges when exposed to a Shiny Stone. 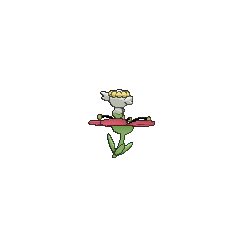 Flabébé is a small white Pokémon with green on its bottom half. It has white arms and long, notched ears, and a green tail. It has a rounded yellow "crown" on its head. It has beady eyes and blush marks, and a small nose. It is seen holding the pistil of a flower, which has petals that come in five colors: red, yellow, orange, blue, or white. These flowers are called "Fairy Flowers" in the anime. When Flabébé is born, it finds a flower and lives in and cares for it during Flabébé's lifespan. It can draw out the power of the flower it holds. It is a female-only species with no male counterpart. 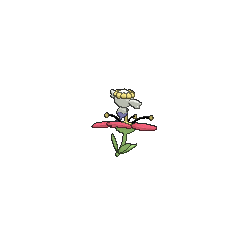 According to the Professor Oak's Holo Coaster from The Green, Green Grass Types of Home!, White Flower Flabébé are rare and difficult to find. Mairin captured a Yellow Flower Flabébé, which she nicknamed Bébé, in Mega Evolution Special I. 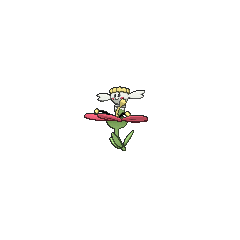 A Red Flower Flabébé appeared in To Find a Fairy Flower!, under the ownership of Grey. An Orange Flower Flabébé under the ownership of Shauna made a cameo appearance in Summer of Discovery!. She made another appearance in A Showcase Debut!, where she was used to help Shauna win the Coumarine City Rookie Class Pokémon Showcase along with Bulbasaur in the second round. Red Flower and Orange Flower Flabébé made their debut appearance in Kalos, Where Dreams and Adventures Begin!. Multiple Red Flower, Orange Flower, Yellow Flower and Blue Flower Flabébé appeared in Facing the Grand Design!. Multiple Orange Flower, Yellow Flower and Blue Flower Flabébé appeared in the opening sequence of Diancie and the Cocoon of Destruction. A Red Flower Flabébé appeared in SM006, during a fantasy. Flabébé is tied with Joltik, Cutiefly, Comfey and Cosmoem as the smallest Pokémon. 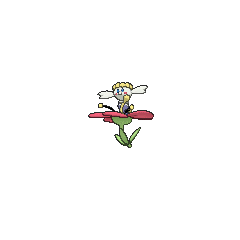 Because only Blue Flower, Red Flower, and Yellow Flower Floette can be found in the Friend Safari, only these forms of Flabébé can have their Hidden Ability Symbiosis. Flabébé may be a combination of ?? ?— flower and bébé (French for baby).